The sixty-third session of the WHO Regional Committee for Europe was opened by the outgoing Executive President of the Regional Committee, Dr Lars-Erik Holm, and began with Dr Mehmet Müezzinoğlu, Minister of Health of Turkey welcoming ministers and delegates from 51 Member States in the WHO European Region. Dr Daniel Reynders from Belgium was elected Executive President. Dr Ray Busuttil from Malta was elected Deputy Executive President. Ms Dagmar Reitenbach from Germany was elected Rapporteur. Welcoming delegations and other participants to Turkey, Dr Müezzinoğlu, Minister of Health, explained his country’s ongoing commitment to people-centred, evidence-based, equitable and sustainable health policies. He explained that commitment at the highest level of his Government ensures that health is regarded as a multisectoral responsibility, and the health sector reaches out to others. One recent development in this area is the development of the National Strategic Action Plan 2013–2017, following the principles of Health 2020. The Minister described how Turkey works to deliver health to people in all parts of society, and is dedicated to ensuring everyone has access to quality health care. He underlined that countries should not restrict health services to their own people, but should also be sensitive to humanitarian health needs. For example, Turkey currently provides the same health services to displaced people from the Syrian Arab Republic now in the country. Dr Müezzinoğlu appealed to WHO to develop further mechanisms to support countries in emergencies, so that they can be activated when needed. He announced that WHO will be opening a field office in the south of Turkey to support the health response for people affected by the conflict in the Syrian Arab Republic. In his concluding remarks, the Minister noted that “nothing is more valuable in life than the right to health,” and expressed his expectation that this session of the Regional Committee for Europe would make decisions that would be a precious contribution to the health of people in the Region. Offering a global perspective on health developments in the WHO European Region, Dr Anarfi Asamoa-Baah, WHO Deputy Director-General commended Member States and the Regional Office for their foresight, at least two decades before the rest of the world, in seeking to address lifestyle changes that affect noncommunicable diseases. He also noted that this Region has promoted universal health coverage long before it became a popular mantra. In reference to this year’s Regional Committee agenda, Dr Asamoa-Baah highlighted the importance of the action plan on mental health, explaining: “Tackling the challenge of mental well-being in a time of economic crisis, respecting human dignity and building hope, this plan deserves the highest level of support.” He also counselled the Region against considering itself an “island” separate from the other regions of the world, citing changes in the demographic for communicable diseases, with an increasing threat from vector-borne diseases and ongoing outbreaks of measles and rubella. The Deputy Director-General concluded his remarks by paying tribute to the Regional Director for Europe, Zsuzsanna Jakab, on behalf of the Director-General, for her leadership and foresight. Providing an overview of both public health advances and challenges in the WHO European Region, and detailing the work of the Regional Office over the past year, Zsuzsanna Jakab, WHO Regional Director for Europe, emphasized the importance of implementation and accountability, following the adoption last year of Health 2020, the European policy framework for health and well-being. “Implementing Health 2020 demonstrates the commitment of all our Member States to better health for our European populations and for generations to come. It shows how action on the whole spectrum of health determinants leads to wider benefits for society, including social, community and economic benefits. I am absolutely determined that WHO/Europe will support all its Member States to help them implement Health 2020 in the light of country circumstances and needs, and will really make a difference,” said Zsuzsanna Jakab. Ms Jakab noted many recent health successes and ongoing challenges across the Region. The maternal mortality ratio has dropped by 54% since 1990, with the European Region enjoying the lowest maternal mortality in the world. Yet women’s risk of dying from causes related to pregnancy and childbirth differs by a factor of over 40 across the Region, depending on where they live and receive health care. WHO/Europe supports countries in decreasing this inequity and, with strong commitment from ministries of health, improvements in the quality of maternal care based on lessons learnt are being observed. The Region has seen a significant fall in adult per capita alcohol consumption over the past 20 years but, despite this overall decline, most marked in southern Europe, there is an upward trend in the east. The European action plan to reduce the harmful use of alcohol provides a framework for effective policy options. So far, 37 countries have a national or subnational policy on alcohol and 10 more are in the process of developing a national policy. The rollout of a revolutionary molecular diagnostic test means it is now estimated that over half of multidrug-resistant tuberculosis cases are being detected, while treatment enrolment increased to 96% in 2012. Treatment success rates vary according to the setting, however, ranging from 18% to 80%. WHO/Europe is working with Member States and the Global Fund to Fight AIDS, Tuberculosis and Malaria to address these gaps. Countries across the Region are experiencing ongoing and long-term effects on health as a result of the economic crisis. Yet participants at the high-level meeting in Oslo, in April, that brought together the health and finance sectors, underlined that even with a restricted budget envelope, governments and ministers of health have a choice and can focus on areas and services that encourage economic growth and reinforce equity. A United Nations interagency health-needs-assessment mission coordinated by WHO to camps in southern Turkey concluded that high-quality health services are being provided to Syrians under temporary protection in Turkey. In close consultation with the Turkish authorities, WHO/Europe is scaling up its response capacity through a WHO field presence in southern Turkey. Responding to the Regional Director’s presentation, there was overwhelming support for implementing Health 2020. Many delegates explained how they are aligning existing national health policies with the goals and objectives of Health 2020, or are developing new national policies based on the framework. Several delegates also linked Health 2020 implementation with defining the post-2015 development agenda, and the importance of promoting universal health coverage. Work is also under way at subregional level, notably by the South-eastern Europe Health Network and a group of small states, to coordinate efforts to introduce Health 2020. Expressing its commitment to implement Health 2020, the delegation from Lithuania, on behalf of all European Union Member States, also underlined that national targets must take account of countries’ different levels of development. It also raised a note of concern that Member States must take account of the financial and administrative resources needed to implement existing initiatives, before adopting new ones. The concern that resources could be spread too thinly was echoed by the Norwegian delegation. The need for ongoing commitment to address multidrug-resistant tuberculosis, and recognizing the challenge of imported cases, was highlighted by Austria and Germany. The German and United Kingdom delegations also called for more awareness of the risks posed by antimicrobial resistance. The Republic of Moldova referred to the continuing health challenges of other communicable diseases including measles and rubella. The delegation of the Russian Federation expressed the country’s long-term commitment to addressing noncommunicable diseases, and Turkey underlined the importance of introducing measures for tobacco control and tackling tobacco trafficking. Broad support was also expressed for the WHO reform process. Noting the focus areas and concerns expressed in Member States’ interventions, Zsuzsanna Jakab explained that the current Regional Committee will focus on accountability and reporting back. In response to the issue of increasing resolutions and commitments and finite resources, the Regional Director added that the session will review current resolutions made over the past 10 years, “sunsetting” those that are no longer relevant, and putting in place a system for developing new resolutions. She thanked Member States for the notable health developments in their countries and strong commitment to implementing Health 2020. Zsuzsanna Jakab, WHO Regional Director for Europe, and Dr Mehmet Müezzinoğlu, Minister of Health of Turkey, spoke to over 20 Turkish journalists and media outlets at a short press conference. Ms Jakab expressed her thanks for the very positive collaboration between WHO and Turkey, and commended the country for its successes in reducing child and maternal mortality, and in introducing tobacco control measures, as well as changing towards a community-based mental health care system. She also outlined two key items on the agenda this week: a European mental health action plan, and a regional framework for surveillance and control of invasive mosquito vectors and re-emerging vector-borne diseases. Dr Müezzinoğlu expressed his support for the issues on the agenda of the sixty-third session of the WHO Regional Committee for Europe, and his full confidence that the meeting would contribute to improving health activities across the Region. Professor Sir Michael Marmot, who led the development of the report on social determinants of health and the health divide in the WHO European Region, explained to ministers and heads of delegations the key findings from the report. He noted that there are persistent and substantial health inequities across the European Region and, despite the Region including countries with some of the best levels of health, even these more affluent countries have increasingly seen inequities in people’s circumstances and declining social mobility and cohesion. As a likely result of these changes, health inequities are increasing rather than diminishing in many countries. The economic crisis that has existed since 2008 has exacerbated this trend and exposed stark social and economic inequities within and between countries. Professor Marmot noted that countries should have two clear aims: to improve the average level of health and to reduce health inequities to bring the health of the less advantaged up to the level of the best. Adding to the discussions, Professor Ilona Kickbusch, coordinator of a report on governance and health that has also informed the development of Health 2020, commented that good health and narrow health inequalities are due to good governance. She highlighted the need to go beyond health in all policies and seek synergies and co-benefits through intersectoral action. The reform of the WHO programme budget was discussed at a lunchtime technical briefing. The reform, part of the broader WHO reform process, seeks to ensure greater accountability and align budget needs with the resources available. A significant development in this process is the introduction of a financing dialogue, bringing Member States and donors together to discuss funding, and thereby improve the predictability of funding, make financing more flexible and increase transparency. Dr Ray Busuttil, Superintendent of Public Health, Malta, and Acting Chairperson of the Twentieth Standing Committee of the Regional Committee (SCRC) reported on its work during 2012–2013. Acting for, representing and advising the Regional Committee, the SCRC had reviewed the agenda for this year’s session, agreeing that it should review the implementation of policies, strategies and programmes adopted by previous sessions, rather than adopt new ones. The session would nevertheless also review two new initiatives: a European mental health action plan, and a regional framework on invasive mosquito vectors and re-emerging vector-borne diseases. Dr Busutill indicated that in assessing the implementation of Health 2020 and finalizing the monitoring framework, the session should aim to minimize the burden on countries. The SCRC had set up two subgroups, one on internal governance as part of the WHO reform, and another on resource allocation to begin after the present session. In addition, the SCRC had given special attention to geographically dispersed offices (GDOs), assessing a proposed outline and process for developing business cases for new GDOs. In particular, it recommended the establishment of two new GDOs, one on primary health care in Kazakhstan and another on preparedness for humanitarian and health emergencies in Turkey, and had reviewed the work of the GDOs in Barcelona, Bonn and Venice. It also launched a review of the status of resolutions adopted since 2002 in light of their continued relevance and alignment with Health 2020. Zsuzsanna Jakab, WHO Regional Director for Europe, reported on the significant progress made on WHO reform in the last year, due in large part to the unprecedented engagement and active involvement of Member States. She described the implications for the Regional Office and for the Region, and emphasized the important regional contributions that had been made to the global debate. Under programmatic reform, the Twelfth General Programme of Work 2014–2019 was approved in its entirety by the World Health Assembly, and with the full support of all the WHO regions. It was seen as a significant improvement on its previous iterations and is the basis for the first programme budget for 2014–2015. The European Region has the most countries and country offices of any region and the Regional Office must therefore optimize its technical resources in Copenhagen primarily through a multicountry and intercountry delivery model. Further, the Health 2020 lens, which is fully aligned with global policies, will henceforth be used to develop all policies, strategies and programmes. A new bottom-up planning process is expected to be fully in place by 2016–2017. Governance reform addresses both the internal governance of WHO and WHO’s role on the global health stage, the latter requiring a clearer definition of roles and responsibilities among the growing number of organizations working in international health. The Regional Office is increasingly involved in hosted partnerships, and is deepening its collaboration with key international players. Internal governance issues focus on streamlining the methods of work and roles of the Regional Committee and the SCRC with those of the global governing bodies. Managerial reform seeks to ensure the predictability, transparency and flexibility of the future financing of WHO. A first global financing dialogue took place last year among Member States and is now under discussion in every region. It remains a formidable challenge, but Ms Jakab was confident that the outcome of a second financing dialogue in November would ensure the full and flexible funding needed for 2014–2015. Imre Hollo, Director, Division of Administration and Finance, described the operational planning under way for 2014–2015, and the extent to which it met the demands of last year’s session of the Regional Committee. Planned staff costs are down, making up only 56% of total costs, and five out of the six categories of work are budgeted within their planned costs. Category 5 alone is overplanned, for the exceptional reason that both antimicrobial resistance and the health security demands of the International Health Regulations are of overwhelming priority. In other areas, Mr Hollo indicated it would be hard to make any further cuts without reprioritization by Member States, through their biennial collaborative agreements with WHO, their country cooperation strategies, and multicountry and intercountry work. Delegates generally welcomed the presentations made, commending the Regional Office on its pioneering role in the WHO financial reform process, on its proposal to launch a financing web portal, on the “North Star” of Health 2020, which now guides its work, and on the bottom-up planning approach, and one delegate urged his fellow Member States to contribute to the continuing dialogue on financial reform. 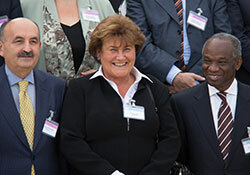 Zsuzsanna Jakab reflected that the combined efforts of the Director-General and all the regions had achieved a lot. While there were challenges ahead in 2014–2015, she expected them to be solved by 2016–2017, and although the bottom-up approach was the way ahead, this need not exclude top-down direction as well.